The AART function adjusts the retention times of target components based on linear retention indices (LRI) and the retention times of n-alkanes. The AART function easily adjusts acquisition and processing method parameters simultaneously. 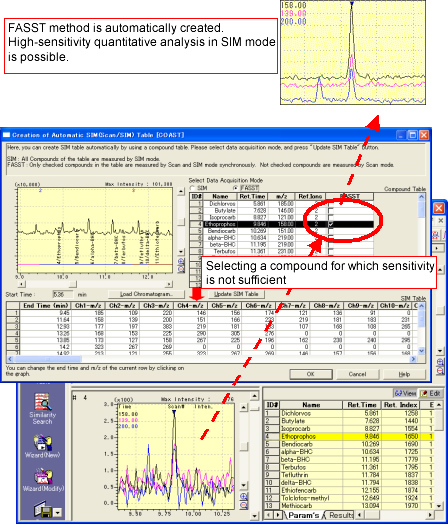 FASST (Fast Automated Scan/SIM Type) is a data acquisition technique used to perform high-sensitivity measurement while retaining qualitative information of the mass spectrum for the compounds for which enough sensitivity cannot be obtained in scan mode. COAST (Creation of Automatic Scan/SIM Table) automatically creates a method file in FASST mode using measurement data from scan mode. By selecting compounds to be measured in FASST mode, a method file is automatically created and easily transferred for FASST analysis using registered analysis parameters. 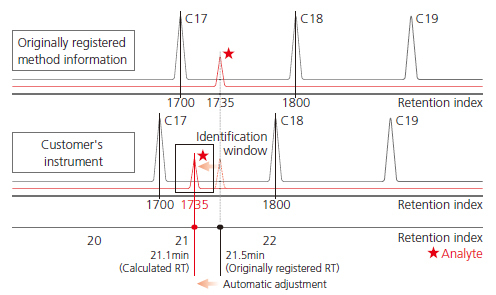 Fine-tuning of the measurement group time is easily possible by clicking on the chromatogram.